What do flea-market junkies do on vacation? Hit the flea market, of course. So, on a recent road trip to Los Angeles, we couldn’t resist a visit to one of the largest collectibles markets in the United States, the Long Beach Outdoor Antique & Collectible Market. And boy were we happy we made the trip—the goods were great and the prices were even better! With spring in the air, we were on the hunt for items for the garden, especially colorful, glossy enamelware. These charming metal pots and kettles bring French country style to any decorated yard. And at Long Beach, enamelware was everywhere! 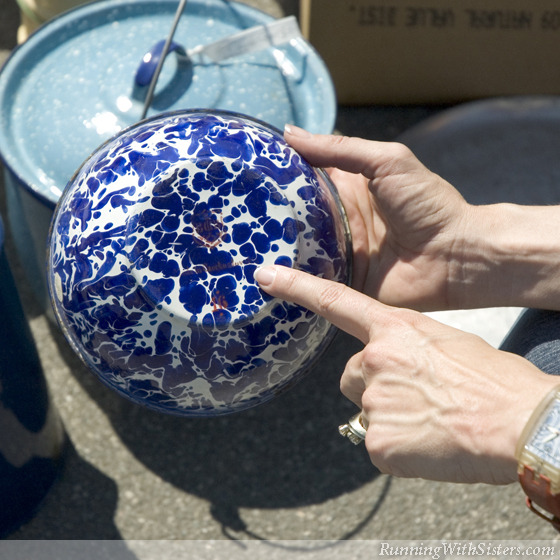 Jennifer found a blue-and-white splatterware bowl with a maker’s mark for only $9. Kitty spotted a turquoise stockpot that she thought would make a pretty planter. She noticed it had a rusty little hole, so she negotiated a bargain price of $15. 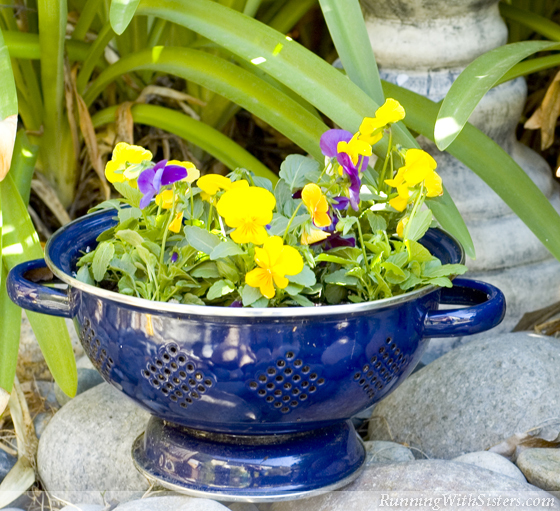 Kitty also scored with a $5 cobalt colander—it’s already primed for pansies with built-in drainage holes! 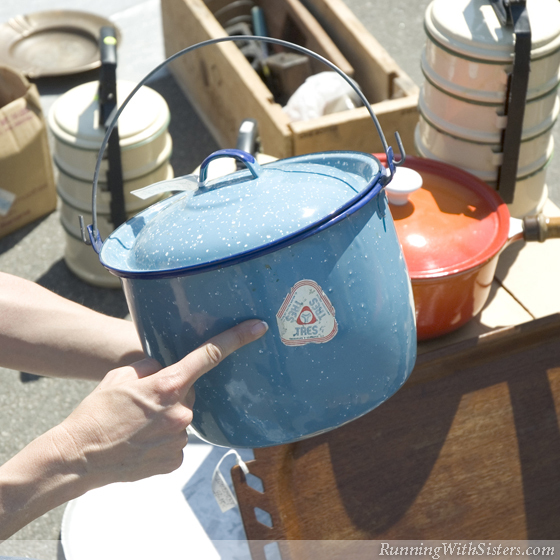 The more enamelware we saw, the more ideas we had for using it in the yard. A blue-swirl pie pan could be turned into a beautiful birdbath by suspending it with a plant hanger. 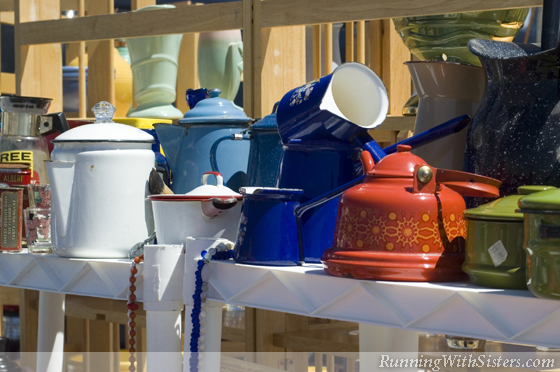 A hodgepodge of enamelware ladles would be darling hanging along the top of a wooden fence. You could start your seedlings in a red and white marbled muffin tin. Kitty came across an orange coal bucket that would be a clever container for gardening tools. And Jennifer decided to create a dish garden in a yellow roasting pan for a look straight from the French countryside. Ooh-la-la! Enamelware is made of iron with a baked-on porcelain enamel finish. It first hit the mass markets in the late 1800s and is still made today, particularly for camping cookware. Blue is the most popular color, but you can also find yellow, green, white, red, and gray in solids, swirls, and speckles. Many pieces that turn up at flea markets are from the early 20th century, and have probably spent part of their lives on a farm—or at least that’s the look. Although age doesn’t matter when it comes to enamelware in the garden, it’s fun to figure out just how old your finds are. Pick up your piece and examine it. 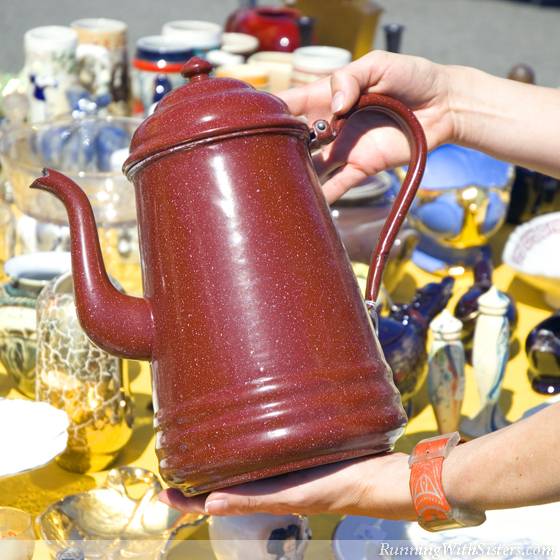 Antique enamelware will feel heavy and substantial. Next run your fingers over any connections. Older pitchers and pots with handles will have rivets. Flip your find over and look for a maker’s mark stamped on the bottom––you could be lucky enough to discover yours is actually dated. 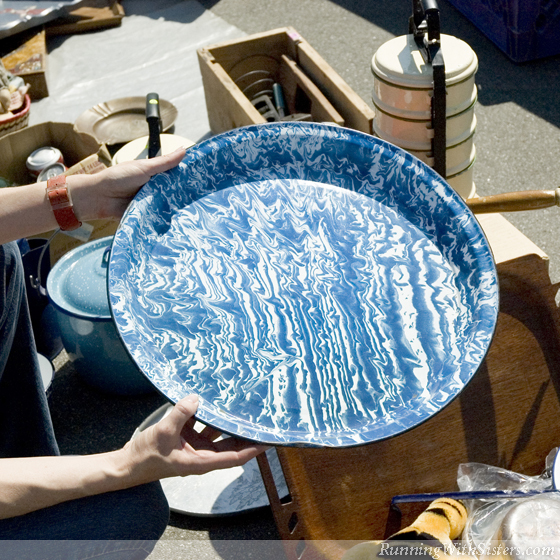 Seeing Spots: Dappled enamelware is also called graniteware or speckleware. Enamelware is not just for French country kitchens anymore. It has become a trendy decorator favorite. 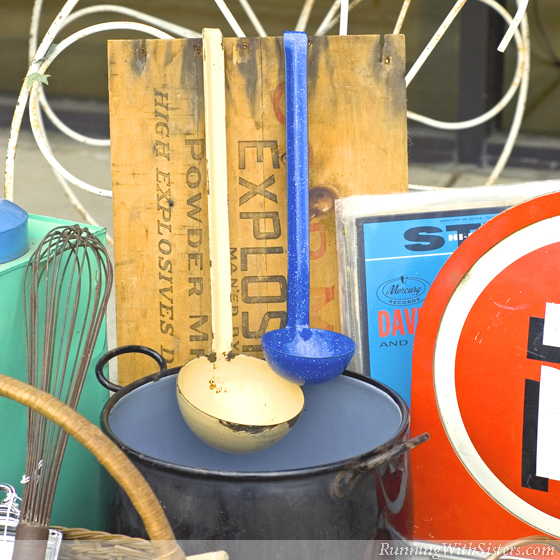 In fact, flower buckets, kitchen canisters, and washtubs are so sought after, they may be scarce and spendy at the flea market. So if you don’t find one at a palatable price, c’est la flea!